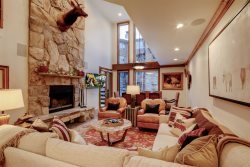 This recently remodeled 2 bedroom unit has a beautiful view of the aspen trees and the ski runs on Deer Valleys Bald Mountain. It has 1 king bed in the master bedroom and 2 twin beds in the second bedroom, which can be made up as a king bed upon request. 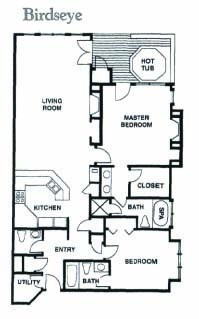 This 1496 square foot 2-bedroom, 2.5 bathroom unit has granite countertops, stainless steel appliances, a wood burning fireplace in the living room and the master bedroom. There is a private hot tub on the outside deck. The master bathroom has an air jetted tub and separate shower. Flat screen TVs are located in the living room and each bedroom. There is also a CD player and IPod docking station so you can listen to your favorite music.